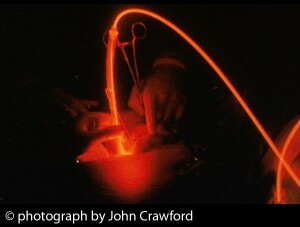 Fluorescence-guided surgery, or FGS, is a photodynamically based surgical approach that exploits the principle of fluorescence during surgery. In FGS, different types of photosensitizers are used to illuminate or “light up” abnormal cells or diseased tissue. A major advantage of this approach is that it enables the surgeon to actually see or visualize in real time the operating field—that is, whatever tissues need to be removed surgically. When compared to other medical imaging modalities, FGS is cheaper and superior in terms of resolution and the amount of diseased tissue that can be detected. FGS is now increasingly viewed as a more effective way to carry out cancer surgery. The logic of this approach is obvious. Consider the example of pancreatic cancer, one of the most deadly malignancies—currently only 5% of patients survive five years. Complete removal (resection) of the tumor is known to improve overall survival of pancreatic cancer patients. However, most attempts to remove the primary tumor result in a metastatic relapse. The usual explanation for this failed treatment is that the surgeon is unable to remove all cancerous tissue due to his or her inability to actually see the tissue during the operation. 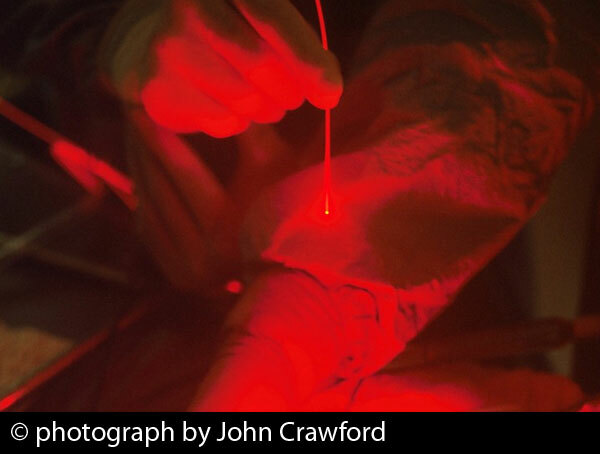 Making tumors fluoresce in the course of FGS offers a huge advantage in terms of detecting the tumor tissue during surgery and thus being able to achieve a complete tumor removal, or what surgeons like to call a “curative resection”. In Europe, FGS has been revolutionizing the way cancer surgeons tackle all kinds of malignant diseases because it helps surgeons identify and remove smaller tumors that could otherwise be missed. With FGS, for example, surgeons can easily detect clusters of cancer cells as small as one-tenth of a millimeter, as opposed to the earlier average minimal cluster size of 3 millimeters in diameter based on standard methods of visual and tactile detection. One of the limitations of FGS, however, is that the fluorescence is only as good as the light access and penetration. For better light access in different parts of the body, FGS employs minimally invasive devices such as laparoscopes or endoscopes. In this case, a system of filters, lenses and cameras is attached to the end of the probe. In generral, the light penetration depth tends to be fairly shallow in the visible wavelengths, but it can reach up to 1–2 cm when excitation wavelengths in the near-infrared light range are used. A key to the success of FGS is the availability of clinically approved fluorescent dyes. In Europe, 5-aminolevulinic acid (5-ALA) is a natural compound that is taken orally three hours before surgery. In the case of brain cancer (gliomas), for example, the 5-ALA is selectively taken up by glioma cells and results in a reddish-pink fluorescence under a blue light. By contrast, the normal brain tissue appears blue. This dramatic contrast allows tumor margins to be seen during the course of surgery. It is likely that other photosensitizers such as Bremachlorin® will yield better outcomes during FGS. Bremachlorin® accumulates in cancerous tissues in a manner that surpasses many other photosensitizers. This could allow for superior visualization of tumors during surgery, and certainly more research is needed to substantiate this claim. In addition, Bremachlorin-PDT should be used concurrently with FGS. This combination strategy allows your physician to treat exactly what they see—first with surgery, then with PDT—during the operation. After the surgeon removes as much of the tumor as possible, the area is illuminated at a higher intensity so that any residual cells are destroyed by the light-triggered photodynamic reaction. This may result in better overall survival and quality of life for people with cancer. Nguyen QT, Tsien RY. 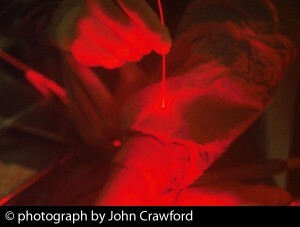 Fluorescence-guided surgery with live molecular navigation – a new cutting edge. Nat Rev Cancer. 2013 Aug 8. [Epub ahead of print] Smith LG, Nakano I. Fluorescence-guided brain tumor surgery. World Neurosurg. 2012;78(6):559-64 Sanai N. Emerging operative strategies in neurosurgical oncology. Curr Opin Neurol. 2012;25(6):756-66. Eyüpoglu IY, Hore N, Savaskan NE, Grummich P, Roessler K, Buchfelder M, Ganslandt O. Improving the extent of malignant glioma resection by dual intraoperative visualization approach. PLoS One. 2012;7(9):e44885. Epub 2012 Sep 26 Pichlmeier U, Bink A, Schackert G, Stummer W; ALA Glioma Study Group. Resection and survival in glioblastoma multiforme: an RTOG recursive partitioning analysis of ALA study patients. Neuro Oncol. 2008;10(6):1025-34 Stummer W, Pichlmeier U, Meinel T, Wiestler OD, Zanella F, Reulen HJ; ALA-Glioma Study Group. Fluorescence-guided surgery with 5-aminolevulinic acid for resection of malignant glioma: a randomised controlled multicentre phase III trial. Lancet Oncol. 2006;7(5):392-401.